Resorcinol (2x)(Acne Treatment), Salicylic Acid (3x)(Acne Treatment), Sulphur (1x)(Acne Treatment). Aloe Vera (Aloe Barbadensis) Leaf Juice, Diazolidinyl Urea, Hydroxyethylcellulose, Lactose (Milk), Maleic Acid, Methylparaben, Propylene Glycol, Propylparaben, Tetrasodium EDTA, Water. Seriously, I have tried all the better known brand names. All the high-end products. Even prescription products and none have even come close to doing what Acnevir has done for my skin! It's seriously a miracle worker. Granted the box isn't that glamorous, but it works! My skin started clearing up in a matter of days. I swear, this stuff is a life-saver! - Does not over dry I would definitely give this a try. It contains sulfur AND salicylic acid. Really helps with all types of acne Doesn't make skin oily Works fast, like the 2nd day,; results were dramatic in a week or two Comes in such a small tube I've been using this for about a month and two weeks along with spironolactone and it really helps! 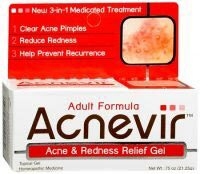 While i was waiting for the spiro to really kick in this helped reduce my acne greatly. So glad I decides to pick it up one day at walgreens. It runs out pretty quickly and make your skin a little dry for the first few weeks but it works wonders! Def deserves a try, because let me tell you....my skin was AWFUL (like really terrible, so bad that everyone would stare at me). Try it! It's a gel, so it doesn't dry out quickly when you're applying it It has resorcinol, salicylic acid, and sulphur Is meant for adults who suffer from acne Works very well None! Or at least none that I've encountered so far I thought that this product was great, and I liked it that there is something out there for adult acne sufferers (even though I'm only 18, but this gives me hope for the future). It's great if you have really oily skin, but I wouldn't recommend it if your skin is very sensitive. If you apply it the way that Dan suggests in his regimen, you can get the results you want. And as usual, use a good moisturizer with this product because it dries out skin pretty quickly with regular use.